Hello friend! I’m going to go out on a limb and say even though it’s technically spring I’m calling it summer because I’ve been swimming three times 😉 When these days start getting warmer and brighter I want to spend less time in the kitchen and eat food that’s lighter, softer, and super easy to prepare. With that in ming is there anything more delicious in spring/summer than asparagus? While I love some raw shaved asparagus or lightly steamed/stir fried with lemon sometimes it’s nice to jazz it up a little bit. And that’s where this recipe comes in! I’ve served this at dinner parties or just eaten it myself when I want to feel fancy. There’s really no bad time for asparagus. It’s also a fabulous food to eat right now because not only is it in season, which means it’s soft and tender and not a million dollars, but it’s also contains inulin which helps feed your friendly microbiome. A healthy microbiome is crucial for digestion, immunity, and to help you clear out some of the junk that may have accumulated after a winter of snacks, Netflix, and hibernation. Now, without further ado, let’s get to the goods! 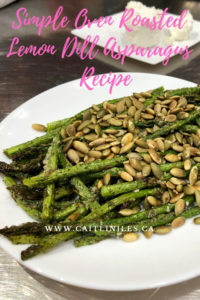 The perfect side dish for those busy spring nights! Preheat your oven to 400F and line a baking sheet with unbleached parchment paper. Take a piece of asparagus and hold it lightly by either end. Wiggle it up and down until the woody part at the end snaps off. This is a little more time consuming than just chopping off the ends, but it ensures you get all the tough parts off and don’t waste any of your precious asparagus! You can either leave the asparagus whole or cut it into thirds lengthwise. Place in a large mixing bowl and sprinkle with olive oil, garlic powder, onion powder, dill, and sea salt. Mix with hands until thoroughly coated then spread evenly across the baking sheet. Remove the asparagus from the oven and sprinkle with Parmesan then set back in for another minute or two. If edges are turning brown and crispy while middle is bright green, you’re ready to go! If they’re not quite there pop ‘em back in for another couple minutes. Top with seed of choice and serve! There you are friend! 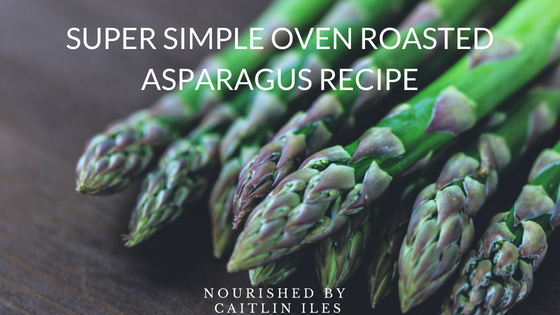 A slightly jazzy, delicious recipe for spring time asparagus!